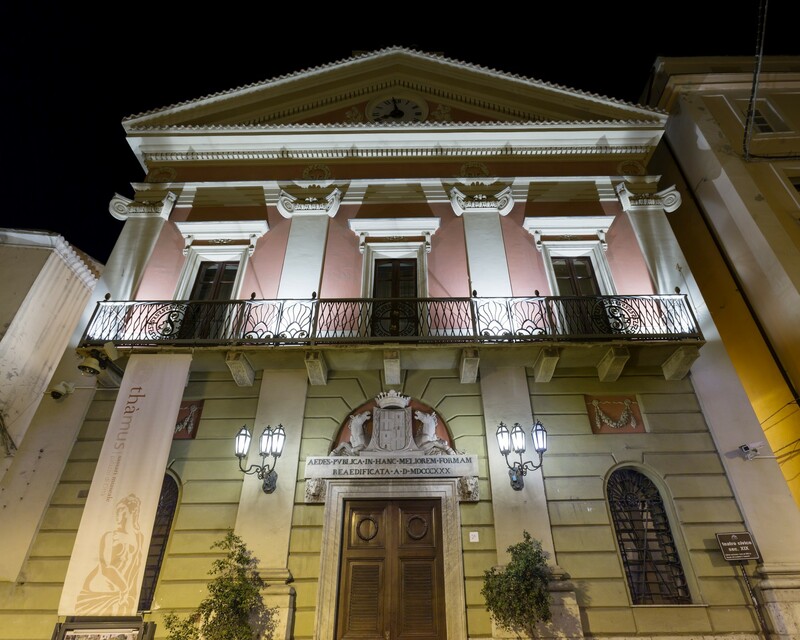 This elegant neoclassical building bears witness to events that have taken place in Sassari. Until 1826, the Palazzo di Città stood where the Civic Theatre is now located, overlooking the Platha de Cothinas (Piazza del Comune) that is no longer there, once the centre of the walled town and the current avenue of Corso Vittorio Emanuele II, still today, as in the past, the heart of Sassari. The precarious conditions of the medieval building and urban renewal in the early nineteenth century launched by King Charles Felix led to the construction of a new municipal building in Neoclassical style, based on a design by architect Giuseppe Cominotti. As well as fulfilling institutional functions, it also became a theatre. This double function lasted for half a century: the town council was first transferred to Palazzo Manca di Usini (1879) and then, in the 20th century, to its current location in Palazzo Ducale (Ducal Palace). 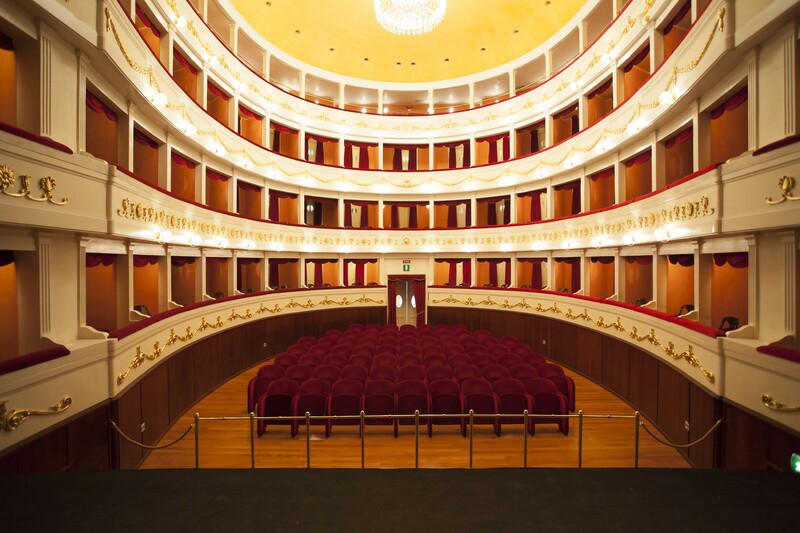 The theatre, designed with a horseshoe layout, based on the example of ‘Palazzo Carignano' in Turin and, in turn, becoming a model for the Civic Theatre of Alghero (1862), was radically renovated, starting in 1947, and was reopened twenty years later. New work followed, at the beginning of the 21st century. Today, it is the setting for concerts, art exhibitions and shows. The main façade, which faces the avenue, is based on the Neoclassical 'Purist' model: over it, there is a triangular gabled pediment and it includes pilasters of the Ionic order. Along the central axis, there is access to the entrance hall, where the statues of two great playwrights are situated: Vittorio Alfieri and Carlo Goldoni. Dominating the entrance, there is the coat of arms of the town and a plaque indicating the date of the building. 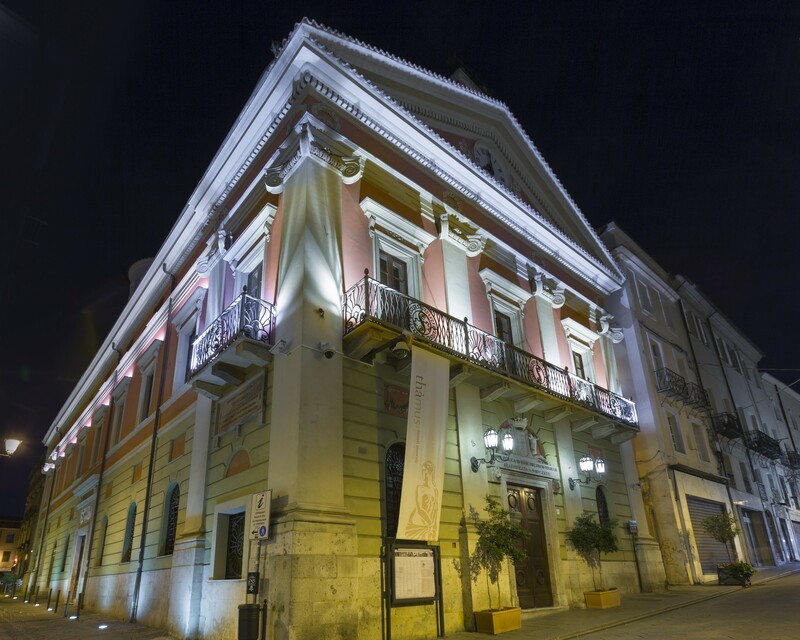 Palazzo di Città is not only a theatre, but also a museum divided into two sections that you can enter from Corso Vittorio Emanuele II and Via Sebastiano Satta. In the west wing, on the ground floor, you will find a room named 'Memoria e Identità', meaning Memories and Identity, and another named 'Forma e Immagine', meaning Shape and Image, (depicting the town enclosed by walls and photos from the nineteenth and twentieth centuries). On the first floor, there are the reception rooms. One of these, the room of the intregu, becomes the 'site' of the festha manna, also known as the Discesa dei Candelieri (Descent of the Candlesticks - 14 August). Inside it, the ceremony during which the Gremi pay homage to the Authorities takes place: the mayor looks out from the balcony, along with the obriere (president) of the farmers, for the traditional toast and to be subjected to public judgement regarding his work over throughout the year, which expressed by disapproving whistles or by applause. On the upper floors, there are another two rooms (educational and 'of the Candlesticks') and on the attic floor, you will find the mechanism of the ancient clock. In the east wing, there is the town's historical documentation centre. Among the main topics, there is that of traditional dress. On the third floor, you will find the 'Sacro e Profano' (Sacred and Profane) room, with references to the religious rituals that take place during Holy Week and popular expressions like carnival, illustrated in works by Eugenio Tavolara: 'Processione dei Misteri' (Procession of the Mysteries - 1929) and 'Mascherata Sassarese' (Masquerade of Sassari - 1937).